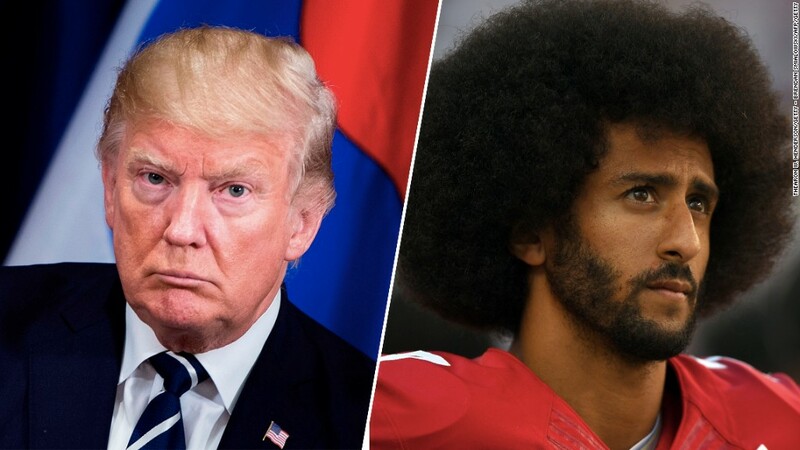 When President Trump lashed out at players who kneel during the national anthem, he took aim at an organization that he's clashed with on multiple occasions. On Friday, Trump said during a rally in Alabama that NFL owners should fire players who protest during the national anthem. The comments prompted players, league officials and team owners to admonish his statements. Here's a look back at some of the other times Trump has tangled with the pro-football league. Back in 1983, the upstart United States Football League, or the USFL, was gaining traction. It debuted as a springtime version of the NFL to approving fans and promising ratings. The league even counted a few Heisman Trophy winners among its players. Trump's skin in the game: He owned one of the USFL's teams, the New Jersey Generals. The real estate mogul was a vocal leader who pushed other team owners to move the USFL to a fall schedule and compete head-to-head with the NFL. He eventually got his way, but it turned out to be disastrous. 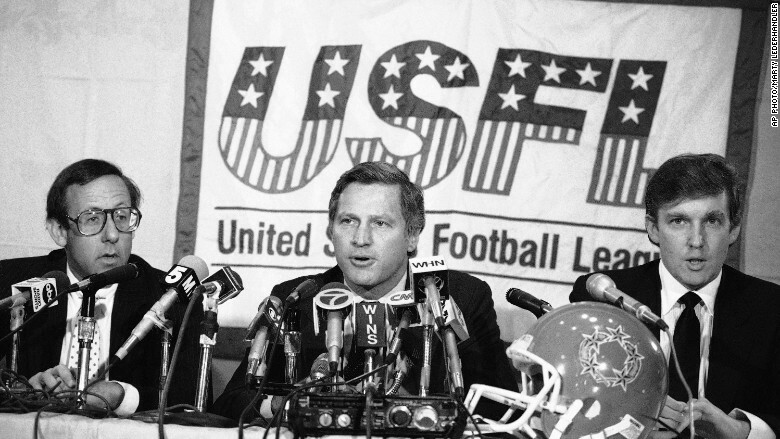 The USFL ended up suing the NFL, accusing the league of holding an illegal monopoly on fall football and attempting to strangle the USFL out of business. Despite winning a court battle, the USFL was awarded just $3 and the league was shuttered in 1986 after just three seasons, according to an archived report from the Los Angeles Times. Trump is widely considered to be the guy who lead the USFL to its demise. He "destroyed" the league, screams the headline of a piece published by Esquire. Trump's fellow New York real estate mogul and current Miami Dolphins owner Stephen Ross, far left, once owned a USFL team. Ross pushed back against Trump's rhetoric on Saturday. He said the country "needs more unifying leadership." Fast forward to a new era in which Trump has a Twitter account, and he began using it to lash out at the NFL. In criticizing a rule change aimed at making the game safer for players, Trump declared in a 2013 post that it was "the beginning of the end" for the NFL. "The NFL has just barred ball carriers from using helmet as contact. What is happening to the sport?" he wrote. He also aired complaints about referees "destroying" the game by "slowing down the fun." Yet, Trump's distaste for the way the NFL was being run didn't appear to quash his interest in buying an NFL team. In 2014, the sports world buzzed when Trump put in a bid to buy the Buffalo Bills -- and he lost. "I bid a billion dollars, all cash on the table. [business magnate Terrence Pegula] bought it for a billion-two, I believe, although they say it was a billion-four. I think he got it for a billion‑two," Trump told Sports Illustrated. The loss sparked another twitter tirade. Even though I refused to pay a ridiculous price for the Buffalo Bills, I would have produced a winner. Now that won't happen. Trump insisted, "I would have produced a winner. Now that won't happen." Finally, during the 2016 presidential election, Trump entered into an awkward fray with the NFL over some facts. General election presidential debates were slated to take place at the same time as football games. "I'll tell you what I don't like. It's against two NFL games. I got a letter from the NFL saying, 'This is ridiculous,'" Trump claimed. An NFL spokesman said that never happened. "While we'd obviously wish the debate commission could find another night, we did not send a letter to Trump," the league said in a statement. Correction: An earlier version of this article incorrectly reported that last year's controversy involved Republican debates. In fact, they were general election debates.